2016 Comic-Con Photos, News, and Videos | Just Jared Jr.
Hope is All Grown Up in 'The Originals' Season Four Comic-Con Trailer! Check out the brand new trailer for the upcoming fourth season of The Originals! The sneak peek gives us a look back at what’s happened over the past few years as Klaus (Joseph Morgan) recites a pretty fitting poem. In case you haven’t heard, the show will be jumping ahead five years when it comes back, so we get a glimpse at baby Hope all grown up. 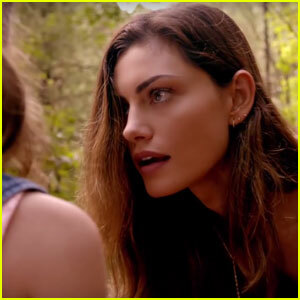 “Mom, are we going to get my dad,” she tells Hayley (Phoebe Tonkin). 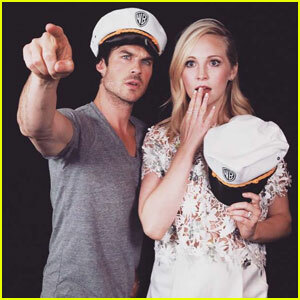 Ian Somerhalder and Candice King get ready to sail the high seas in this fun photo shoot from 2016 San Diego Comic-Con this past weekend. The Vampire Diaries stars weren’t the only ones who posed for the boat-themed shoot. The casts of iZombie, The Originals, The 100, Powerless, Supergirl, Gotham, Frequency, Arrow, and Legends of Tomorrow also took part. 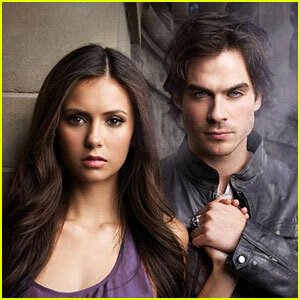 In case you missed the news, TVD‘s upcoming eighth season will be the show’s last. We are so sad! Peyton List strikes a pose while arriving at the panel for her new CW show Frequency held during 2016 San Diego Comic-Con on Friday (July 22) in San Diego, Calif. The 29-year-old actress was joined by her co-stars Riley Smith and Mekhi Phifer, as well as executive producers Jennifer Gwartz and Jeremy Carver. That same day, the group stopped by SiriusXM’s Entertainment Weekly radio show. Frequency follows Detective Raimy Sullivan (List), who has always wanted to prove that she is nothing like her father. In 1996, when Raimy was eight years old, NYPD Officer Frank Sullivan (Smith) left Raimy and her mother, Julie, behind when he went deep undercover, got corrupted, and got himself killed. Or so the story has always gone. Frank’s former partner, Lieutenant Satch Reyna (Phifer), is now Raimy’s mentor and friend, and he has urged her to let go of the hurt and anger she still feels about Frank’s disappearance and death, but the old pain still lingers. Twenty years later, Raimy is stunned when a voice suddenly crackles through her father’s old, long-broken ham radio � it’s Frank, somehow transmitting over the airwaves and through the decades from 1996. FYI: Peyton is wearing an AllSaints dress. News broke this weekend that The Vampire Diaries would be ending after eight seasons on The CW, and fans want to know if Nina Dobrev‘s Elena will make an appearance! The cast and showrunner Julie Plec sat down for an interview during 2016 Comic-Con, and answered that very question. “Not to put too much pressure on anything Nina Dobrev..but a promise was made. An emotional promise that I’d like to see come to life. You heard it here…there’s been friendship promises made, and now we’ll see if we can deliver on them,” Julie said. Watch below! Chloe Bennet strikes a pose with her Agents of S.H.I.E.L.D. co-star Clark Gregg at Entertainment Weekly’s Comic-Con Bash held at Float, Hard Rock Hotel on Saturday night (July 23) in San Diego, Calif.
Lots of other celebs hit up the party including co-stars Ming-Na Wen and Elizabeth Henstridge. The 100‘s Ricky Whittle, and Gotham‘s Michael Chiklis, David Mazouz, Camren Bicondova, and Jessica Lucas also were seen mingling at the annual party. Be sure to check out photos from the Agents of S.H.I.E.L.D. stars hitting up Comic-Con events earlier in the week! Couple Gets Engaged During 'Supernatural' Comic-Con 2016 Panel! 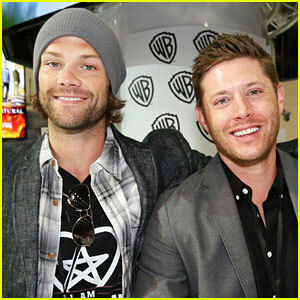 Jared Padalecki and Jensen Ackles look like the best of friends during an autograph session for Supernatural at 2016 Comic-Con on Sunday (July 24) in San Diego, Calif.
Later in the day, the guys hit up the panel with their co-stars Mark Sheppard, Misha Collins, Samantha Smith, and Ruth Connell to discuss the show. During the panel, a man in the audience took the microphone and proposed to his girlfriend! “Congrats, guys!” Jared said after the sweet moment.